Eccentric training (also known as negative training) is a technique that allows you to push your muscles past their normal point of failure. This allows you to lift, eccentrically, 30 to 40 percent more weight that you could normally handle (concentrically). Eccentric training is much more demanding on the muscles and therefore it fatigues them far more than you could concentrically. It actually damages muscles to a greater extent, so there is a higher possibility of greater stimulation and subsequent growth. The idea of devoting entire workouts to performing eccentric only movements started back in the mid 70's, so it's a tried tested and true technique. Outside of the bodybuilding world, eccentric training is used by physio-therapists and doctors as a rehabilitation tool. If you've reached a plateau, and are not seeing any results from your training, it's either malnutrition or low quality workouts at fault. If it's your workout that needs spicing-up, then I have a possible key to your problem... Eccentrics! My philosophy behind eccentric training is thus: Boost the intensity and you'll boost your gains... but boost the intensity and the weight being used, then you double your chances of boosting your gains. This is, in fact, the foundation of eccentric training. You increase both the intensity of the set by bringing it past the point of failure, as well as increasing the weight being used during a set. Having said this, I do not devote entire workouts to eccentric training... definitely not. I consider this a complete waste of time when it comes to bodybuilding. No doubt though, dedicating an entire workout to eccentric training may help you bust through a plateau, but there are other ways around it. If I'm going to use eccentric techniques in my training, I usually use them with forced reps. It's a case of doubling the intensity of a given set, or what I call 'Stacking Intensity Techniques'. For example, say I am performing a set of lying skull crushers with 120 lbs on a cambered bar. 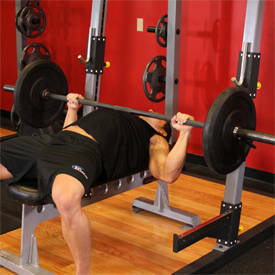 If I can perform 6 reps on my own, then I would get my training partner to help me squeeze out two to three forced reps.
Once these forced reps are completed, I would get him to perform the concentric phase of the exercise for me, and I would then slowly lower the bar to my forehead, performing an additional two or three eccentric only reps. It is very important that you lower the bar very slowly during these eccentric reps to get full benefits from them. Four to five seconds for each eccentric rep is good. The slower you lower the weight on the eccentric phase of a rep, the more stimulation will be provided to the muscle, therefore more muscular growth. It's that simple! This method of training produces excruciating pain in the target muscle and is an example of doubling the intensity of a set... using two different intensity techniques in one set to completely exhaust and totally annihilate the muscle. When I stack intensity techniques at the end of a given set, there is an extremely high amount of stress placed on my muscles. I'm surprised that my eyes haven't started to bleed or a bone hasn't found its way out through my skin - LOL. In all honesty though, when you stack two intensity techniques in a workout, the increased stress on a muscle requires much longer recovery times, so use them sparingly in your workouts, recover and grow like crazy. Eccentric training is especially effective on compound movements such as the bench press, military press, and barbell curls, but is not limited to these 3 applications. Really, any exercise that is able to be effectively spotted can be further intensified with the use of eccentric training... But don't get the wrong impression. Although you are stronger while performing the eccentric phase of a rep, you are actually using less muscle than you would concentrically. It requires less motor units and less muscle fiber recruitment to perform the negative portion of an exercise as opposed to the concentric phase. However, the muscle fibers that are actually being recruited are receiving a much higher percentage of damage, therefore allowing these particular fibers to grow much bigger and stronger than otherwise possible. Once the fibers that were activated during your negative training become bigger and stronger, you will then be able to handle heavier weight concentrically. Handling a heavier weight concentrically will result in the activation of the fibers which remained inactive during your negative session (as well as the previously activated fibers), resulting in more stimulation and subsequent growth. In order to perform eccentric training and reap its desired effects, you'll need at least one, preferably two, training partners to do the concentric phase of the exercises for you. There are two different methods of eccentric training that may be applied to your workouts. First, there's simply a workout dedicated to negatives only, which I consider to be the least effective of the two. This is where you dedicate a full workout session to performing only negative phases of a specified exercise. This can be useful for building up strength, and is half decent at working out of a plateau. The second type of eccentric training, which I consider to be by far the better of the two, consists of performing your negatives on the last set of your workout by performing 2- 4 extra eccentric reps.
Use negatives at the end of a workout and I guarantee your target muscle will almost explode. In this case, the negatives are used to add intensity to your workout, and allow you to apply unbelievable stress and stimulation. I'll illustrate how to perform a negatives only workout using the barbell bench press as an example. Once in the gym with two willing training partners, warm up as you normally would for that muscle group and have yourself a good stretch. The first step is to load approximately 40% more weight than you can normally use for an 8-rep set onto the bar. Since I can perform 8 reps at 255 lbs, I would put around 360 lbs on the bar. Have your training partners (notice the 's' on partner in this case) hand-off the weight to you, and then you must slowly lower it down to your chest. As a general rule of thumb for eccentric training, take 4-5 seconds to lower the weight. Once you have the eccentric phase completed, get your training partners to lift the weight back to the starting position for you. Continue to perform this for 2-3 sets of 4 reps, then lower the weight by 10%, so you will be lowering 30% more weight than you can normally do for an 8 rep set and perform 1 additional set of 4 reps. In this case, I'd be incorporating a drop set into my negative training, and would be lowering 330 lbs. Another example of 'stacking intensity techniques'. Once you can properly perform 8 eccentric reps with your 40% increase in weight, increase the weight by 5% for your next eccentric workout. To sum up, negative training is a great method of blow-torching a muscle group. You must severely limit the sets you perform and the number of training sessions to avoid overtraining. If you do so, you will get bigger and stronger - faster than you ever imagined possible!